Truly passionate about writing books, I am always aiming to give the reader inspiration and delight. From the concept to the final copy in your hands I love everything about the process - even the editing and the nitpicky details. Look for books about quilting and more. And one day, fiction and maybe even picture books. Turn inspiration from your daily life into meaningful and fun quilt designs. Popular quilt designers share 10 complete quilt patterns, plus advice and wisdom on the art of quilt making. See how ideas from people, places, and things become original design concepts. Inclides compelling designs from Jen Carlton-Bailly, Cynthia Frenette, Carolyn Friedlander, Andrea Harris, Rossie Hutchinson, Heather Jones, Amanda Jean Nyberg, and Blair Stocker. 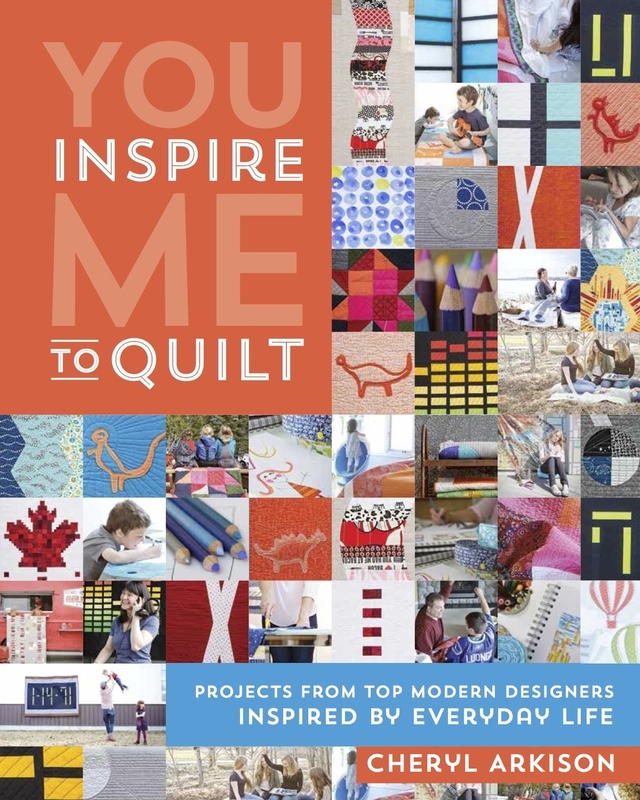 Ask for You Inspire Me To Quilt in your local quilt shop or pick it up online. *I am available for retreats and workshops to help you create your unique design. A collection of ten comprehensive design workshops led by ten leaders in the Modern Quilt Movement. Subjects range from colour use to machine quilting, from prints to solids, from improvisational piecing to large scale design. My workshop is on Circles and Curves - with detailed instructions on techniques and a pattern for a modern sampler called Compose Yourself. Pick up the Essential Guide in your local quilt shop or online. *I am available for workshops on circle and curves, including improv techniques. Blog Aid: For Haiti was the brainchild of Julie Van Rosendaal. Quick to support a mentor and a worthy cause, I contributed her Baba's borscht recipe to this print on demand book. You can still order this recipe collection. It is a still a well used book in my cookbook collection. More than a collection of patterns, this book is both a resource for using low volume fabrics and inspiration for taking the time to slow down and sew. The themes of Eat, Relax, Shop, and Explore are addressed in a series of personal essays. The eight quilts and eight sewing projects included in the book build on these themes. Designed for the confident beginner, the patterns are simple and straightforward. This unique book is at once exciting and restful, like the perfect Sunday stroll. Purchase A Month of Sundays at your local quilt shop or online. *I am available to teach projects and fabric selection from this book. A compilation book that includes 99 different block designs from top modern designers. It was published on the leading edge of the Modern Quilt Movement. I've got two block designs in the book, one incorporating my love of circles and low volume fabrics, the other bold and graphic. Look for 99 Modern Blocks in your local quilt shop or online. Are scrap piles wreaking havoc in your sewing space? Not sure what to do with all those tiny bits of gorgeous prints you hate to part with? Amanda Jean Nyberg and I share a passion for scraps and we're here to help you get creative with 16 scrappy quilt projects that include piecing, applique, and improvisational work. No two scrap quilts are the same so they enourage you to make each quilt your own. It also includes tips for effectively cutting, storing, and organizing your scraps. Buy Sunday Morning Quilts at your local store or pick it up online. *I am available for workshops based on techniques and patterns from this book. Paper piecing is a technique that can frighten off many quilters, but there is no reason for that. Tascha Breucher put together a strong book that demystifies the technique and inspires in the wide range of projects. It includes a calendar project sure to delight. A sweeping rainbow block incorporated into an art portfolio in my contribution to the book. Ask for Playful Little Paper Pieced Projects in your local quilt shop or pick it online.